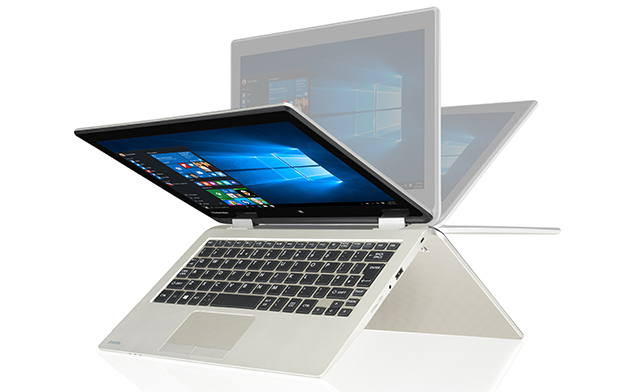 Series: Like other 2-in-1 designs, the Radius 11 offers both laptop and tablet functionality. Instead of a detachable docking tablet, the laptop hinge allows the screen to be folded back into other positions. The modes include laptop, tablet, tabletop (folded flat), presentation (propped up like a tent), and audience (touchscreen shown with keyboard folded back as a base). When closed, the Radius 11 measures 2.18 x 28.96 x 19.81 cm (0.86 x 11.4 x 7.8 inch) and weighs 1.32 kg (2.9 pound). The Radius 11 is a budget laptop that comes with a 11.6 inch touchscreen. The 1366 x 768 resolution display is reasonably bright and clear. The laptop keyboard has a basic chiclet-style design, with black square keys but no backlight, so using the keyboard in a dimly lit environment might be troublesome. It features all the keys you would normally expect to find on a notebook, but many have been shrunk to fit its small frame. When the display is folded back, the keyboard is automatically disabled, and automatic screen rotation is turned on. The Satellite Radius 11 is powered by an Intel Celeron processor, a budget dual-core design designed for low end consumer laptops, coupled with 4 GB of RAM. It's functional, but noticeably slow, even when performing very basic tasks, like opening a new browser tab. It will do for things as simple as typing or checking email and Facebook, streaming videos. However, most other tasks will be a bit sluggish. Storage comes in the form of a 500 GB hard disk. Ports and connectors are limited, but no more so than many ultraportable-class laptops today. Two USB ports are included, USB 3.0 on the left side and USB 2.0 on the right side. There's an HDMI output for connecting a monitor, TV or projector, and an SDXC slot for memory cards. A single 3.5 mm headset jack allows connection of earphones with mic for video chats. In addition, it also features a webcam, Bluetooth 4.0, and built in stereo speakers. 66.85%: This rating is bad. Most notebooks are better rated. This is not a recommendation for purchase.